I used to think that French pronunciation was tricky, what with silent letters, rounded lips, nasal sounds, and so on. That was until I heard a native speaker of French complain about English pronunciation. So let’s agree that languages have their own pronunciation systems. One is not necessarily any more or less logical than the other. They are just different. Also, one is not any easier or harder than the other. You think Chinese tones are hard to master? They can’t be all that hard: more than a billion people handle them with ease, some even as young as two years old. Same with languages with clicks, whistles, and other features. So this week we’ll look at (and hear) some words with odd pronunciations. I should use scare quotes here: these are words with “odd” pronunciations because the words follow the rules of the languages they are borrowed from. It looks odd to us only because we aren’t familiar with those rules. We’ll see words borrowed from Scottish Gaelic/Irish, Greek, Italian, and French. Finally, we’ll throw in a word native to English -- centuries of tumbling in the river of humanity has polished its edges and smoothened its pronunciation. noun: A social gathering, typically involving folk music, dancing, and storytelling. 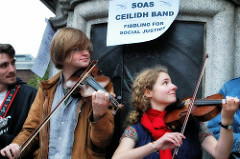 From Scottish Gaelic ceilidh and Irish célidhe (visit), from Old Irish céile (companion). Ultimately from the Indo-European root kei- (to lie, bed, dear), which also gave us city, cemetery, Sanskrit shiva, and incunabulum. Earliest documented use: 1875. Katriena Knights; Where There’s a Will; eXtasy Books; 2018. 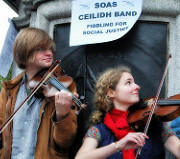 See more usage examples of ceilidh in Vocabulary.com’s dictionary.